Nitrile Coated Foam Gloves Black on Black Dozen Pairs. 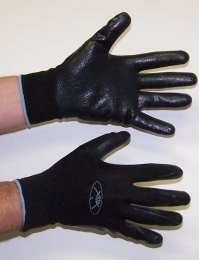 Black nitrile coated foam glove. Form fitting. Breathable. Textured palm and fingertips. Ultra lightweight black nylon foam shell. Individually bagged per pair. Made in China.